The San Francisco Museum of Modern Art (SFMOMA)has announced the acquisition of Edward Hopper's Intermission (1963), among the artist's largest and most ambitious paintings, and one of the last significant Hopperworks remaining in private hands. Intermission was acquired from Fraenkel Gallery, San Francisco, in part through gifts from the Fisher and Schwab families, and will immediately go on view to the public at SFMOMA on Friday, March 23. In the last years of his life, Hopper, who was never prolific, made only two complete works each year—one in the spring and one in the fall. Intermission was painted in March and April of 1963, and was one of the last four paintings that Hopper finished before his death in 1967. Measuring 40 by 60 inches, it is among his largest paintings and evokes the artist's signature dramatic cropping of cinematic camera angles, and the high-keyed lighting of stagecraft, both of which add an emotive and artificial sensation to his tightly controlled, understated narrative. "Intermission is an iconic work, exemplary of Hopper's late period and style, and establishes him as a contemporary master beyond his historical achievements of the early twentieth century," says Gary Garrels, SFMOMA Elise S. Haas Senior Curator of Painting and Sculpture. "The painting is also significant in relation to SFMOMA's deep holdings of work by artists of the Bay Area Figurative tradition, such as Robert Bechtle, Richard Diebenkorn, and Wayne Thiebaud, as well as photographers strongly represented in the collection like William Eggleston, Walker Evans, Robert Frank, and Stephen Shore, who share affinities with Hopper." In conjunction with this acquisition, SFMOMA has deacessioned another work by Hopper in the museum's collection—Bridle Path (1939), which is awaiting sale at auction with Sotheby's. A smaller painting that portrays three figures on horseback riding toward the West 72nd Street entrance to Central Park in New York City, Bridle Path is of interest to Hopper scholars as an atypical work by the artist. Known as one of the most singular twentieth-century American painters, Hopper has influenced generations of artists, writers, filmmakers, and photographers with his moody, quiet tableaux. His best-known paintings investigate everyday scenes in which isolated figures are contained within interiors of common locations—such as theaters, hotels, bedrooms, offices, train stations, or restaurants—or outdoors on city or country streets. "This acquisition brings to the Bay Area a truly exceptional work by Hopper, arguably the most profound visual poet of individual human experience that this country has ever produced," says SFMOMA Director Neal Benezra. "We are enormously grateful to the Schwab and Fisher families for their continued generosity, and for supporting our vision for the growth of SFMOMA's collection by ensuring that it includes work of only the finest quality." Since SFMOMA moved to its current building in 1995, its holdings have more than doubled in size through strategic collections growth, which in turn has driven the museum's major expansion project now in progress. Joining the 195 major artworks promised to SFMOMA as part of the 2011 launch of the museum's Collections Campaign, the unparalleled gift of some 1,100 works from the Fisher Collection in 2009, and an active acquisitions program that adds several hundred works to the collection annually, this latest addition furthers the museum's position as one of the foremost collections of modern and contemporary art in the world while bolstering the city's stature as a global art destination. Hopper came up with the idea for Intermission while he was watching a movie, and his wife, Josephine Hopper, arranged for him to work on the painting in an empty theater. However, Hopper decided to complete Intermission at his home and studio in New York City. A surviving preparatory sketch for the painting reveals that he considered including another figure in the third row. In an interview he revealed, "There's half another person in the picture." The final composition depicts a solitary woman in a theater, sitting alone in the first row of a side aisle. Seemingly waiting for others to return from intermission, she appears lost in thought, staring off into the distance as she sits contently in a comfortable-looking dark green theater seat with her ankles crossed. Sharply cropped horizontally, the composition includes only the front edge of the stage and a small portion of a yellow curtain. The main focus is on the self-contained figure sitting alone among empty seats. While it is known that Hopper's wife insisted on modeling for all of her husband's female figures, she suggests in notes left in her record book that Intermission is more of a psychological portrait rather than a straightforward representation of herself. Hopper explained during an interview that he thought of the sensibly dressed woman in the painting as "Nora," and that she was an "egghead." In her notes, Josephine Hopper writes: "Nothing of the comfortably bleak [is] lost on the highly conscious 'Nora,' with strong, long hands." She further describes her as "not the kind to slip [her] feet out of the long, reasonably high heeled pumps" and "an efficient secretary or priced chatelaine of [a] big house." Perfectly exemplifying one of Hopper's signature subjects, Intermission also reveals the artist's use of lighting and tonalities to convey a cool yet intimate portrait of isolation. Underneath a shadow that follows the molding along the wall, the figure sits with her face partially highlighted by the falling light. 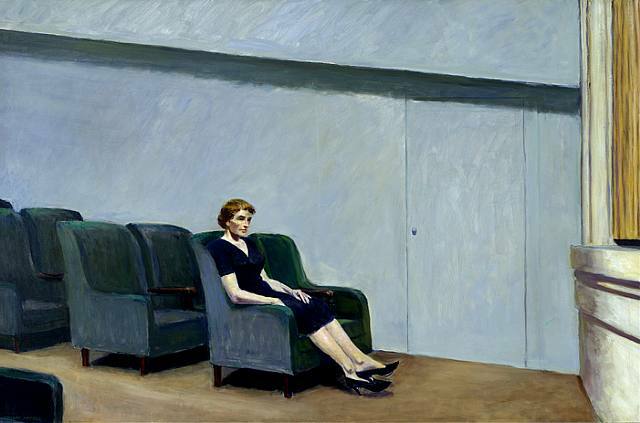 Hopper was known to thin his paints in his later works—here the green armchairs of the auditorium fade from bright green to a bluish grey, giving them a sketchlike, landscape quality. Overall, the painting is luminous with glowing color and a highly abstract background, which is a field of loose brushwork that gives the painting an extremely contemporary style and feel. Almost immediately after Hopper completed the canvas, it was recognized as one of his best works and was included in his second retrospective at the Whitney Museum of Art the following year in 1964 (the Whitney's first retrospective of Hopper's work was in 1950). Intermission was also included in the artist's third Whitney retrospective, which traveled to SFMOMA in 1982 in its original Van Ness location. Since the mid-1990s, Intermission has been in a private West Coast collection and most recently was included in a Hopper retrospective organized by the Tate Modern in 2004. "Though a number of museums would have been prime candidates to acquire this major Hopper, I wanted to try to keep Intermission close to home," said Jeffrey Fraenkel. "SFMOMA's collection provides a superb context for this painting, not least because of the museum's strength in photographs by the likes of Robert Adams, Robert Frank, and William Eggleston, each of whom revered Hopper's sensibility and transformed it into something all their own." Born in 1889, Hopper grew up in the small Hudson River town of Nyack, New York. From a young age, Hopper attended the theater and film houses with his mother and sister—and later with this wife, Josephine, a former stage actress—where he would make sketches of performers and audience members. An early interest in stage design and cinematic techniques were of particular importance for Hopper and would have a strong influence on his compositions throughout his career. Hopper's parents encouraged him to study commercial illustration, and in 1899 he attended the Correspondence School of Illustrating in New York. In 1900 he transferred to the New York School of Art (also known as the Chase School and later the Parsons School of Design) and continued his focus on illustration until enrolling in a painting course taught by William Merritt Chase. From 1903 to 1906 Hopper studied with Robert Henri, a leading figure of the Ashcan school, which was a group of realist painters best known for portraying scenes of everyday life in New York's poorer neighborhoods. Henri was perhaps Hopper's most influential teacher, introducing him to the work of artists Edgar Degas and Édouard Manet, both of whom depicted theatrical performances in their work. Following post-graduation travels in Europe, Hopper returned to New York to begin working as an illustrator. Although he continued to paint and participate in exhibitions, his work was slow to garner attention. He sold his first painting at age 31—Sailboat (1913), which was included in the Armory show that year—and did not sell another work for ten years. At this point in his career, Hopper had developed what would become his signature style of placing solitary figures in sparse interiors or public spaces with a strong focus on light and shadow. Two on the Aisle (1927) is the artist's first complete canvas on this subject, in which he depicts two people taking their seats in a nearly empty theater; the only other person in the audience sits alone reading. The theater and movies would continue to be one of the main subjects addressed in his compositions including the well-known canvas New York Movie (1939), in which Hopper depicts a female usher standing beneath a hallway light. She appears lost in thought as the audience focuses on the film screening. Importantly, two of the last four paintings that Hopper made before his death were of the theater, Intermission (1963) and Two Comedians (1965), underscoring the sustained significance of this subject matter in his oeuvre. SFMOMA welcomes more than 650,000 visitors annually, and more than 46,000 students visit each year. Since opening its south of Market building in 1995, SFMOMA has added more than 13,000 works to its collections, 95 percent of which were donated, doubling its holdings to 26,000 works. At the same time, SFMOMA's family programs have increased fivefold, teacher training programs have increased sixfold, and gallery tours have expanded to 1,800. SFMOMA has mounted a series of exhibitions that have drawn both record attendance and critical praise, including recent exhibitions by Diane Arbus, Olafur Eliasson, Eva Hesse, Frida Kahlo, William Kentridge, Sol LeWitt, Richard Tuttle, and Jeff Wall.